"I kind of like sometimes failing in spring because it gives you a better idea of what you need to do," McCarthy said. "It kind of takes off the bulletproof sheen that you get in the offseason of, ‘I'm going to win the Cy Young this year and everything's going to be where I want it,' and you realize right away it's still just as hard as you remember." This is a great read. 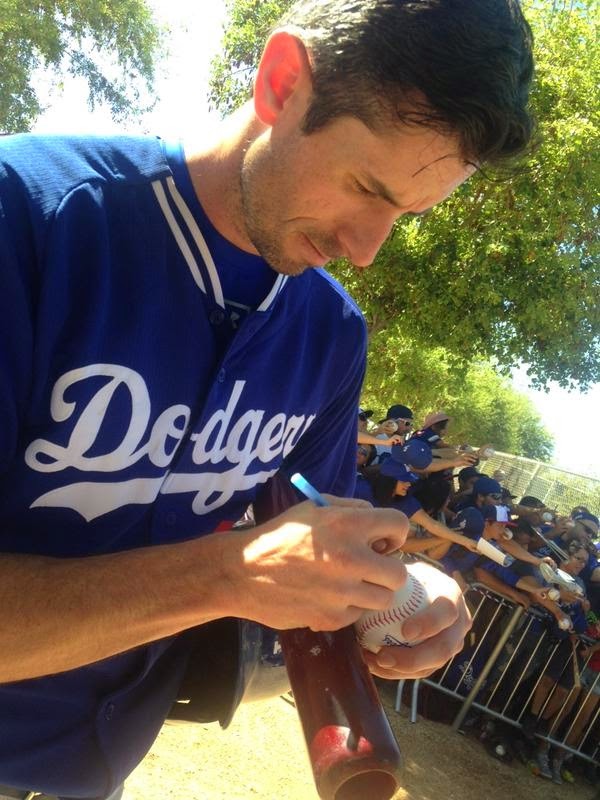 Via Craig Calcaterra at Hardball Talk, "How in the heck did my kids become Dodgers fans?" But the real game-changer, particularly with my son, was Yasiel Puig. At some point in the past two years he heard me saying something about Puig. Maybe while doing a radio spot, maybe while just talking, but he knows that I talk about Puig differently than I talk about other players. He asked me why that was one time and I explained how Puig is different than a lot of other guys for many reasons. I think it's fair to say that Joc will be our starting center fielder. Via Mike Bauman at MLB.com, "Pederson letting play make case for starting job." "What I like with Joc now is he's staying in the middle of the field; earlier on, it was a little bit pull," Dodgers manager Don Mattingly said. "His at-bats are good and he seems to be able to get himself a good pitch to hit. That's as key as anything." Scott Killeen at Sons of Steve Garvey shares even more photos of Tommy Lasorda at Camelback Ranch, here. Via Ken Gurnick at MLB.com, "Guerrero's defense catching up with touted offense." Via Chris Cwik at Big League Stew, "Will Ferrell reflects on his wacky baseball experiment with David Letterman." There's a video of his appearance to watch. Also, Brad Mangin (a photographer for Sports Illustrated) shares a bunch of his pics featuring Will Farrell during his spring training escapades on his blog. Go here to check those out. Mangin was there for the entire thing. Clayton Kershaw and Corey Seager are the Dodgers 2015 Spring Training Ping Pong Champions! Watch a bit of it below. BTW, the giant head cutout of Justin Turner being hoisted around by Darwin Barney once belonged to former MLB FanCave participant Aaron Roberts. Per his twitter, he traded it to Barney for a couple of balls.